On this date in 1922, Spanish royalist Gen. Francisco Javier de Elio was garroted in Republican Valencia. Elio (English Wikipedia link | Spanish) was a career Spanish officer noted for being the last Viceroy of the Rio de la Plata in South America. The Rio de la Plata forms the border between present-day Uruguay and Argentina, and by the time Elio self-proclaimed his viceregal rank, the May Revolution had confined Spanish authority to Uruguay. * He maintained the Spanish monarchy’s power in Montevideo until revolutionaries routed his forces at the Battle of Las Piedras** and Elio had to return to Spain. This was just in time for the Spanish crown, as that country’s liberals had answered the chaos of the French invasion by promulgating in 1812 one of Europe’s most forward-thinking constitutions. King Ferdinand VII wholly repudiated this constitution upon his re-enthronement at the end of the Napoleonic Wars, and this soon led to yet another liberal revolt in 1820† and yet another French invasion. 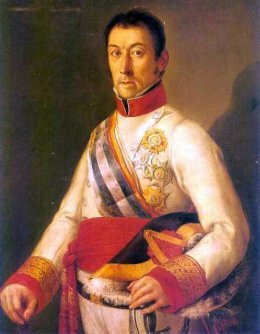 Elio, who administered Valencia with a rough hand for Ferdinand, was such a ferocious monarchist that revolutionaries took him prisoner in the 1820-1823 “Liberal Triennum”. The attempt by a group of mutinous cannoniers in 1822 to place Elio at their head (with or without the general’s foreknowledge) led to his condemnation by a military court. The September 26 London Times preserves two accounts by opposing partisans of Elio’s end. * When a Spanish colony, Uruguay was known as the Banda Oriental. ** The date of this decisive battle, May 18 (1812), is still kept as a Uruguayan national holiday. † Guess what happened to the guy who led that 1820 revolt.